My first Dragonfly Sock is almost done -- and in record time. 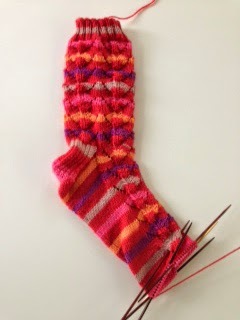 I should have time tonight to kitchner the toe and cast on sock number 2. More importantly, we are cautiously optimistic about my son. The latest round of blood test results came in yesterday and he is negative for everything, including Lyme Disease. A few of you mentioned Lyme, and you were right on; the doctors thought that was a possibility. He is finally feeling better, after 6 weeks. At this point, the conclusion is that he had a really nasty bacterial infection. I really, really hope it is over because he is so excited to start veterinary school next month. So far, this summer has been the best of summers and the worst of summers. I am really loving my graduate writing class and we have had mild, lovely weather so I often bike the 14-mile round-trip to and from class. However, my son has been quite ill and they can't figure out what it is. He has had flu-like symptoms for a long time and his bloodwork keeps coming back with odd results. We are now waiting for the results of the most recent tests. Of course, I am worrying about him all the time. It's almost harder to have him sick now that he is 26 and lives on his own. At least when he was little I could keep a close eye on him! Sorry about the sideways photo. Sometimes I don't really get my i-Phone! So in the midst of this, I was lucky enough to win a a Helen Stewart pattern from the lovely Deb Hickman of A World of Imagination (which you must check out if you aren't already a reader). When I wrote to thank her, I told her about my son -- and she added a second pattern. I am so touched. Knitters are truly the best, kindest people. I do appreciate all of you who read and comment here. I'm sure I don't say it enough, but you are all wonderful and you make a difference to me! I looked through my stash, but I truly don't have anything that is just right for the Pebble Beach Shawl. I like the hombre coloring style that Deb is using, so I looked through the projects on Rav and discovered the beautiful skein you see above from Art-by-Ana. Check out her Etsy shop -- but be forewarned, you are going to have a hard time not buying something. She has an amazing color sense, and I love the way my "cake" (as she calls it) feels. If only I didn't have so much homework tonight. I can't wait to swift up the "cake" and cast on! Tah-dah: The Ojo de Dios Shawl is complete! And yes, it is beautiful, but the pattern has a design flaw. It looks great from behind, quite dramatic, but it doesn't hang well in the front. The way it was modeled for pattern should have given me a hint of that problem. 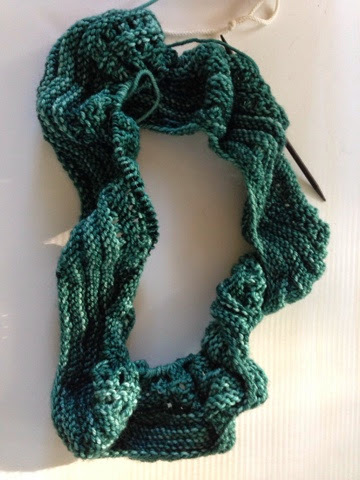 Some knitters reported that they found this to be an easy pattern on Ravelry. I struggled with the triangles -- maybe that's just me. The yarn -- Plymouth Gina -- is affordable and beautiful, and comes in lots of lovely colorways. I haven't blocked it yet, so I'm hoping it will grow some so that it is more of winter shawl. If you like this pattern, make sure you read all the comments on Ravelry before you take the plunge! 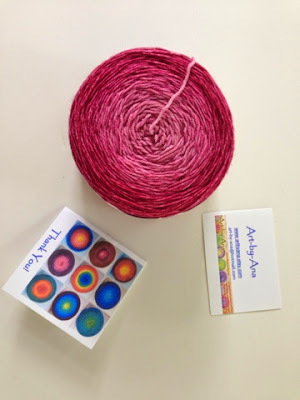 And thanks to those of you who let me know that Tami Amis is updating her yarn shop. That would imply that she is fine but busy. The pattern is Dragonfly Socks. I read about it recently on Pixelknit's blog. Her finished pair is so pretty that I wanted some on my needles. It is a fun easy pattern. I am making one mod: I'm doing a heel flap. 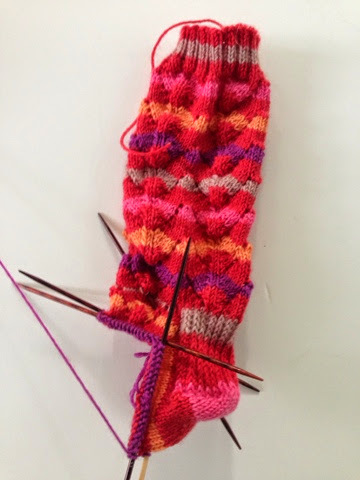 The pattern calls for a short-row heel, but I'd just as soon stay with the tried and true. Does anyone know what happened to Tami Amis? She hasn't posted since early July and I'm getting worried! As of today, my parents have been married for 56 years. Pretty amazing. If Keith and I are married for that long, we will celebrate in the year 2070, when I will be 111 years old. Hmm. I'm not sure that we'll get that far! My parents took us out for dinner last night to celebrate at one of Madison's very nicest restaurants, L'Etoile, and we had a great time. The food really was good. Even Keith enjoyed it -- and he's the kind of guy who prefers low prices/big servings to high prices/small servings. We all left quite full. Here's a glimpse. 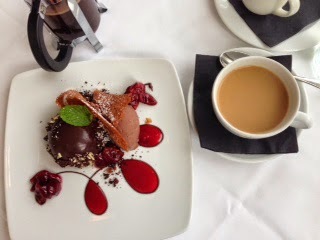 For dessert I had a giant marshmallow truffle with chocolate pudding. Feel free to drool. It really was amazing. 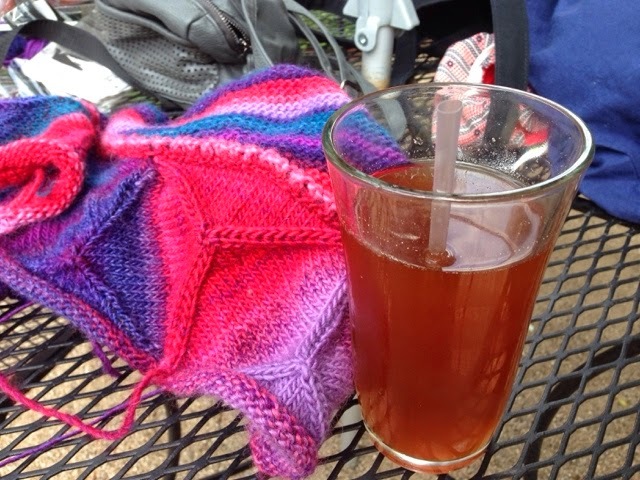 My summer classes have been sucking up most of my waking moments, but I did take some time this afternoon to meet up for knitting and chatting with a friend. 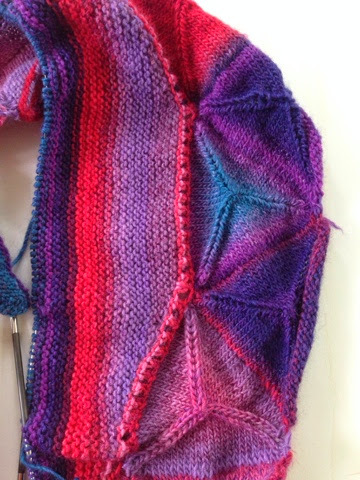 Yes, I'm STILL plugging away at my Ojo de Dios Shawl. But, the end is in sight! Which frankly surprises me because I thought I would be knitting away at the garter section for the rest of the calendar year. However, I started casting off this afternoon. I wish I could keep going, but I have my big presentation on Monday, so that has to come first. The sooner I finish planning for it, the sooner I can relax and knit! 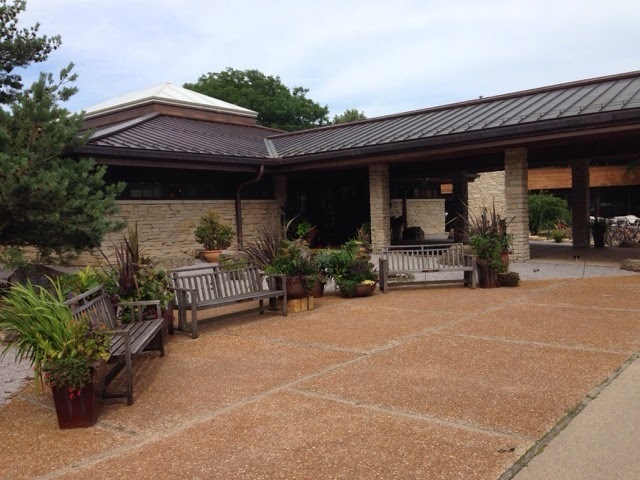 These is where the Greater Madison Writing Project meets each summer. 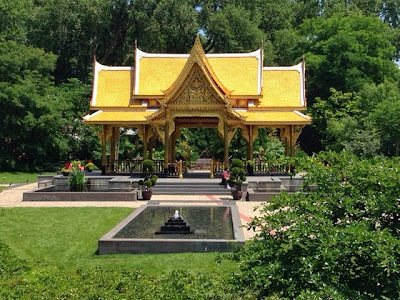 We get free time, when we can go out into the gardens and read or write. However, we get 6 graduate credits for this -- and there is enough work to justify each one of those credits! I'm not complaining; just explaining. All I have for you is another pretty dull photo of my second "28's Cousin 57!" For once, I'm doing pretty monogamous knitting on two projects that are mostly garter stitch. Still loving the yarn, which is from Neighborhood Fiber Co. Karida Collins started dying yarn in a basement apartment in Washington, D.C., and has since relocated to an artists' community in Baltimore, Md. Her colors are nothing short of scrumptious. I wish I knit faster so I could buy more of them. There is a reason for such mindless knitting: My graduate class on teaching writing started Monday, and it is amazing. Intellectually stimulating, challenging, fun, thought-provoking. There are 15 students in the class -- all teachers in one form or another -- and every single one of them is smart and creative. I'll share more about the class in the coming weeks, as all of us bloggers are also writers. Let me add that the class is also exhausting. We meet from 9 a.m. to 4 p.m. daily and there is ton of homework! This is also the reason that I'm behind on my commenting, so please accept my apologies. I'm planning to catch up after school today and tomorrow! 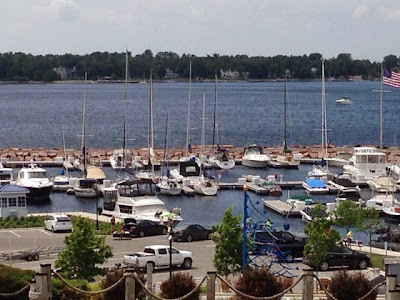 Don't forget to see what everyone else is up to with Tami Amis. 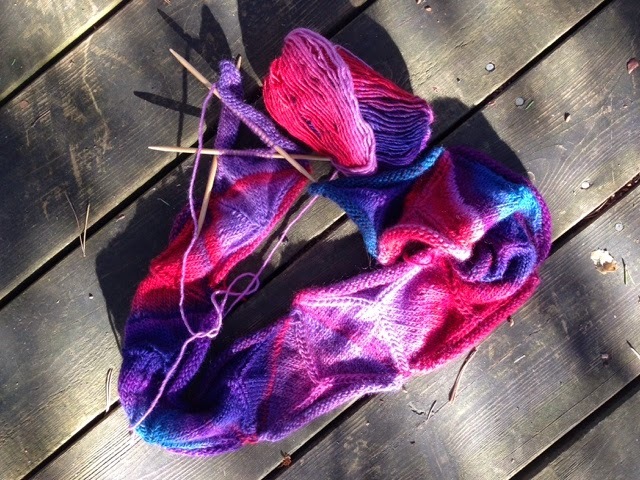 Some years ago, blogger Rose Red coined the term "GAAK," which stands for Growth As A Knitter. I absolutely love this term so I am resuming my campaign to bring this acronym into common usage. I think it is just as useful as KAL (knit-along) or SSK (slip, slip, knit). I experienced some GAAK over the weekend. Having finished the 17 triangles for the Ojo de Dios Shawl, I had to start the garter section. Garter is, of course, a cinch, but this shawl is shaped by short rows, and I have long been perplexed by the whole wrap-and-turn thing. Wrapping and turning is quite simple, but picking up those wraps has been mysterious to me. However, I carved out an hour to sit down with my knitting and computer. I just kept watching videos on picking up wraps, and I eventually found one that made sense to me. Now, I can hardly wait to get to those wraps. It's funny how something can go from impossible to easy in a second -- if you keep trying, of course. Is there a technique that took you some time to master? 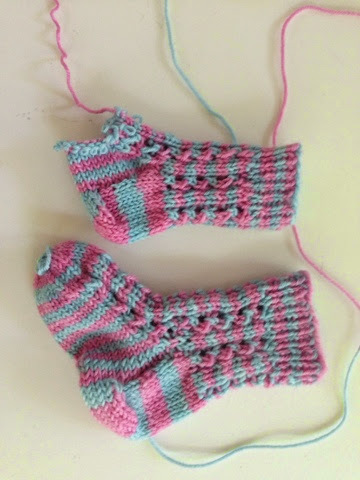 Even though I cast on the same number of stitches, the second sock is significantly smaller than the first one. Apparently my gauge has changed. For a while, I kept on knitting, thinking that I'd just block the heck out of sock number 2. But the more I knit, the worse the size discrepancy became. Finally, I realized that this pair of socks was not worth much of my time. The yarn is left-over from a pair of socks, so I don't even have any financial investment in this project. I am going to frog the whole project! I don't do this very often, and I'd forgotten how freeing it is! I may have to frog a few more UFOs! 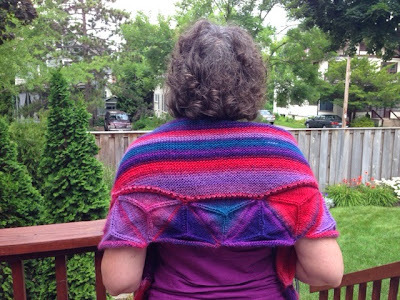 I am struggling with my vacation knitting, the Ojos de Dios Shawl. It begins with a line of 17 triangles, each picked up from the one before it. 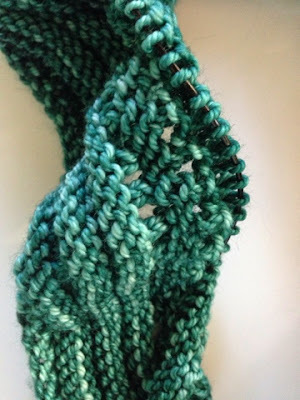 A number of knitters have said on Ravelry that this is a fun and easy knit. That is definitely not my experience. I'm struggling with the cast-on of each triangle and finding the first knit row of each triangle difficult. 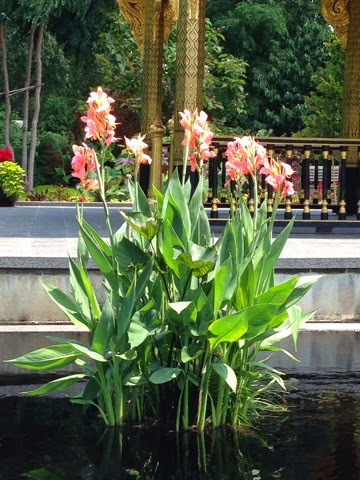 However, I do think it is really gorgeous! I am, at least, happy with my color choice. 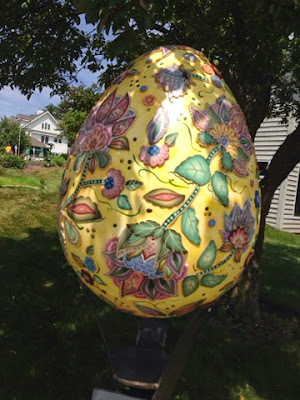 ... where there are beautifully decorated eggs. This one is dressed up with polymer clay! 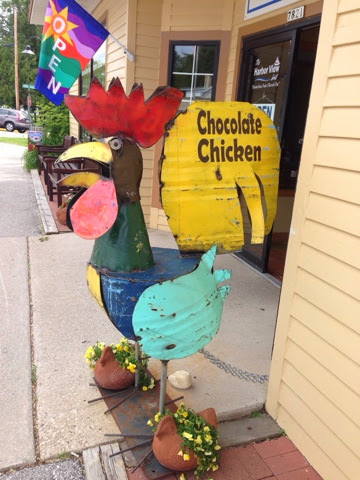 And who could resist stopping at a candy store called the Chocolate Chicken? 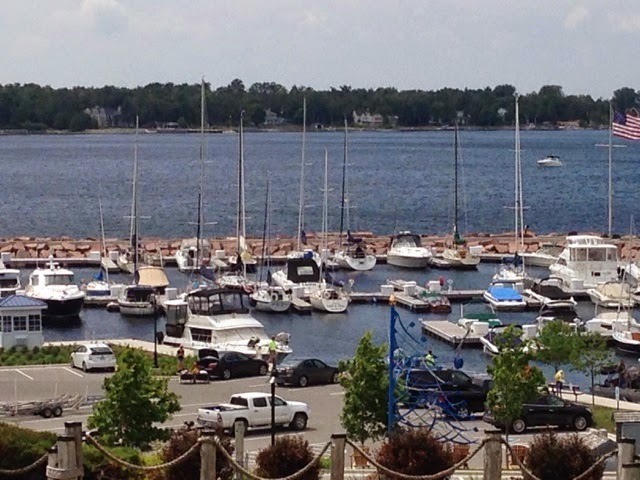 We are being very leisurely and doing little more than relaxing. Keith was doing long bike rides each day, but yesterday one of his spokes broke. Apparently that puts the entire bike out of commission. So, now I get to spend more time with him! He'll have to amuse himself when I'm doing the homework for my class, but I think he'll be totally fine with taking another nap!